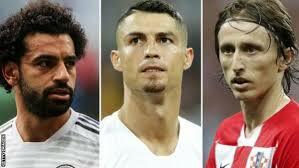 The 2017/2018 Ballon d'or award Modric, Cristiano Ronaldo and Mohammed Salah emerge the top three finalists for the 2017/2018 Ballon d'or award. The FIFA legends panel comprising of the formal Chelsea midfielder and legend Frank Lampard, England boss Fabio Capello and Ronaldo Nazario Brazil legend compiled the first 10 men list which includes Cristiano Ronaldo, Harry Kane, Raphael Verane, Luka Modric, Kylian Mbappe, Antoine Griezman, Kevin De Bruyne, Eden Hazard, Mohammed Salah, Lionel Messi omitting the last year third runner up Neymar. The voting which ran from 24th July till 10th August with four groups of football community eligible to vote comprising of fans, journalists, national team coaches and Captains each section of the community weighing 25% where required to vote their favourites in choices by which the first choice has five points the third choice has three points and the third choice has one point. 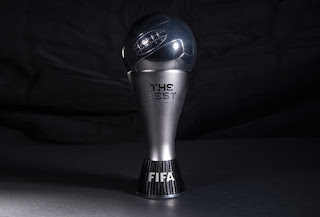 Luka Modric who shock the world by winning the UEFA men's player of the years award, Cristiano Ronaldo who consecutively won the past two edition of the award and five in his gallery and Mohammed Salah who won the African footballer of the year emerges top three finalists omitting Lionel Messi who has been on top three since 2006, the winner will be announced on 24th September in London. The three nominees for the new best goal keeper award for 2017/2018 are Thibaut Courtois (Chelsea/Real Madrid), Hugo Lloris (Tottenham Hotspur) and Kasper Schmeichel (Leicester City). The best coach of the year nominees are Zinedine Zidane (Real Madrid), Didier Deschamps (France) and Zlatko Dalic (Croatia).